The purpose of this retreat week is to enjoy together the important energetic sites in the Algarve and to effect good change for ourselves and all those around us through joy, dance and sound. We will start by spending time together acclimatising to the rhythm of Portugal using Casa Fuzetta as our base learning together with joy into spiritual practice. This will include Yoga, Paneurythmy dancing, and sounding. We will visit islands off the coast near to us, eat in beach restaurants, swim and enjoy. We will then travel to the bases of the ‘foundation pillars’ of the Tree of Life in Portugal starting at the heart, and visiting the root and the crown in the motion of a lemniscape. Europe takes its name from the classical myth of Europa and the Bull, and mainland Europe can indeed be seen imaginatively as a ‘bull’ with the British Isles seated on its neck as ‘Europa’. Spain is the ‘head of the bull’ and, as such, Portugal forms the ‘face of the bull’. Sintra, which is just north of Lisbon, has been known as ‘the Nose of Europe’ for centuries. The Algarve is the mouth and chin of the bull. We have discovered major landscape temples that build a full ‘tree of life’ within Portugal. The three ‘foundations’ of the pillars are situated along the Algarve coast. We intend to visit each of these foundation points and together work towards activating/reinvigorating these sites. Seemingly much of this was understood and marked by the Knights Templar, who started working in Portugal from 1111 AD, seven years before the Templars were officially recognised by the Roman Catholic Church. St Bernard of Clairvaux established the Knights Templar and Cistercian Monks to represent the Twin Pillars of tradition and sent them to Portugal with the stated intention of creating “Heaven on Earth”. An esoteric name of the country, as displayed on the royal seal of Portugal’s first king, Afonso Henriques, is Portugral, meaning “Through you the Grail”. The root point of the right-hand pillar of this landscape temple is the wild and wonderful Sagres promontory which, together with its ‘twin’, Cape St Vincent, is the most south-westerly point in Europe. Sagres promontory is where Prince Henry the Navigator set up his famous School of Navigation. Many of the sites we will visit are associated with the Knights Templar, including their first headquarters in their new capacity of ‘The Order of Christ’ at Castro Marim which is at the base of the left-hand pillar. As well as visiting and experiencing the landscape chakra locations, we will also discuss the vital role the Knights Templar played in the creation and development of Portugal. The root point of the central pillar of harmony and bliss, and the heart point, is at Faro. There is a medieval cathedral in the centre of Faro old town which is a perfect place to celebrate this. This is only 10 miles from Casa Fuzetta. The week will start with 2 days of retreat ‘inner’ work together. This will be followed by a 3 day pilgrimage, in the sense of honouring the places by greeting, appreciating and enjoying them, their people and each other. We have two principles which we endeavour as a group to fulfil, which are to make the effort to love who we are with, wherever we are and whatever we are doing, and to do the right thing in the right place at the right time with the right intention. In this way we can enhance the places and the whole landscape temple, enthusing it with love and thereby helping to transform the energies into an ethereal fountain of light. In such ways we help to build the light body of the planet. All will be celebrated on the last night together at Casa Fuzetta with a feast and loving cup. 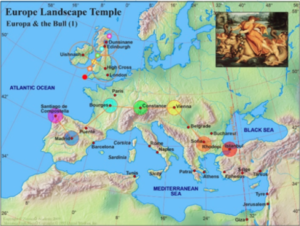 In addition, by pilgrimaging in this way within the ‘face’ of the Bull of Europe, we can help Europe to metaphorically breathe its physical breath in conjunction with the more spiritual breath associated with the alta-major chakra (represented by the British Isles/Europa). The two breaths, breathing in harmony, are what are needed. Saturday 4th May – arrive at Casa Fuzetta; welcome meeting followed by champagne and dinner on the roof terrace. We have arranged for some very special chefs, Ricardo and Sarah, to look after us. Within the programme below, Sarah, Gabriella and Heather will lead special events and sounding. Sunday 5th May – Yoga on the top roof (for those that want this) followed by breakfast on the terrace at Casa Fuzetta. After a morning meeting and attunement, we will go out to one of the islands by boat taxi, eat lunch in beach bar/restaurant, spending the afternoon on the beach and swimming. We will return to the house for dinner and further celebration. Monday 6th May – We will likely dance before breakfast, enjoying breakfast on the terrace of Casa Fuzetta. There will be morning talks in the house. Lunch and the afternoon will be ‘free time’, discovering and enjoying Olhao and the house, or possibly going out to Culatra Island by boat taxi to eat and swim. We will meet again together in the evening. Dinner will follow on the roof of Casa Fuzetta. Tuesday 7th May – After breakfast we will set off by air-conditioned coach. We will briefly stop in Faro which is at the heart of this landscape temple and travel on, arriving at Sagres Point, the most south-westerly point in Europe (the foundation of the right-hand ‘golden’ pillar). This is where Prince Henry the Navigator built his navigation school in the early 15th century. Portugal’s great explorers, including Gil Eames, Bartholomew Dias, Vasco da Gama, Magellan and possibly Columbus spent time here. It is a very special and ancient site. We will visit the church and the huge ‘compass rose’ carved into the rock, believed to be one of the most esoteric symbols in Portugal, and walk out on the sacred promontory to visit the dramatic and symbolically important sink holes. We will have a late lunch at a beach restaurant near Sagres and travel on to Caldas de Monchique. This is a spa village in the hills above the Algarve. They have a swimming pool and ‘extraordinary’ water treatments (which must be tried!). We will have dinner and stay at the hotel. Wednesday 8th May – After breakfast at the hotel, we will trek up into the woods above Caldas de Monchique. We will return to Faro for an al fresco lunch and visit the medieval cathedral together. We will return to Casa Fuzetta for sharing. We will then eat tapas together in a local restaurant in a square near to the house. Thursday 9th May – After breakfast we will travel to Castro Marim and visit the 12th century ‘templar’ castle (the foundation of the left-hand ‘silver’ pillar). We will go on for lunch at Praia Verde Restaurant, high up on sand cliffs with panoramic views of the Atlantic Ocean. We will return to Casa Fuzetta for a meeting to share, reflect and thank followed by a celebratory dinner including a ‘loving cup’ ritual. Friday 10th May – After breakfast the pilgrimage ends. Casa Fuzetta, Olhao, is 20 minutes by taxi from Faro airport. Due to numbers, accommodation will be provided at Casa Fuzetta for those who require double or twin bedded rooms. Guests requiring single rooms are encouraged to stay at a local hotel or B & B and to spend all time with the group including all meals. The Real Marina is a 4 star hotel 10 minutes walk from Casa Fuzetta – Hotel details: telephone 00351289598010 or reservas.alg@hoteisreal.com. The B & B next door to Casa Fuzetta is the ‘Guestmar’ – contact details 00351915618134 or geral@guestmar.pt. Cost include the spa hotel in Caldas de Monchique, for double/twin occupancy staying at Casa Fuzetta, entrance fees, coach hire, all teaching, all breakfasts, most lunches and dinners (see below). Costs exclude flights and transport to and from Casa Fuzetta, lunch on Monday 6th May, minibars, hotel pay TV, laundry, hotel phone, and all drinks away from Casa Fuzetta are at your own cost.